The church of Oravainen was build in 1795-1797. It is a wooden cross-church with an octagon center tower ending on a cupola. The main entrance has Doric (Greek) style columns. The column effect has been modelled in the upper part of the tower with wood paneling. Simpler paneling has been used for decoration on the walls and corners. There is also a separate bell-tower next to the church (not visible in these pictures), but it was not build in this project. 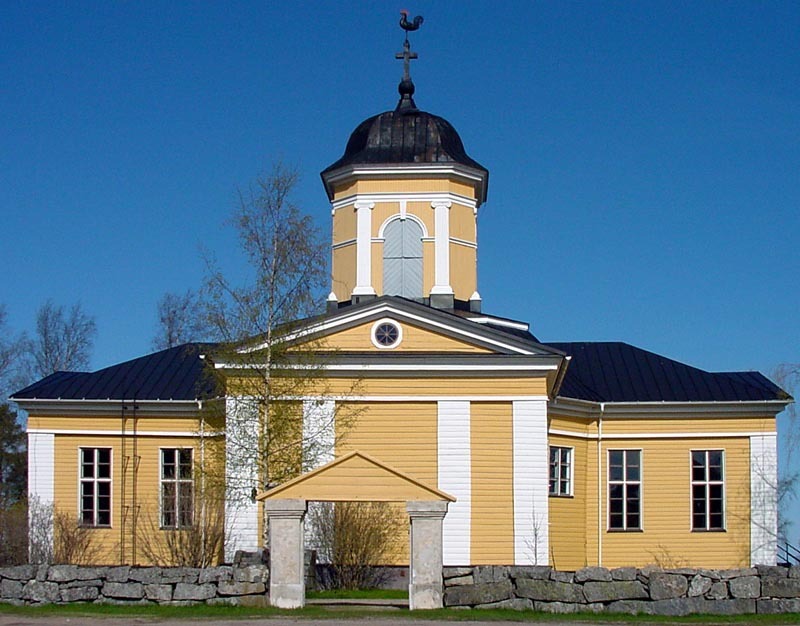 The text over the main entrance dedicates the church to the then king of Sweden, Gustaf IV Adolph in the year MDCCXCVI (1796). This diagonal photo gives a good impression of the complex nature of the roof. 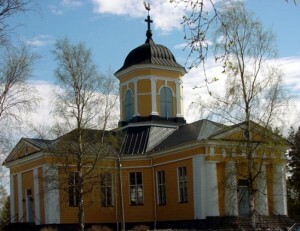 The backside of the church. As an interesting point of design is the lack of any windows on the main altar wall. The altar wing has side windows though, so the altar doesn’t dwell in darkness completely. An octagonal cross church floor out of a 3mm card and then walls from balsa. The brown card on the picture was only for sizing purposes and isn’t part of the actual model. 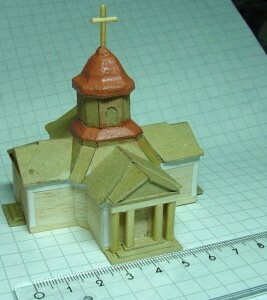 In a way the model has three layers: wall, roof and tower layers. 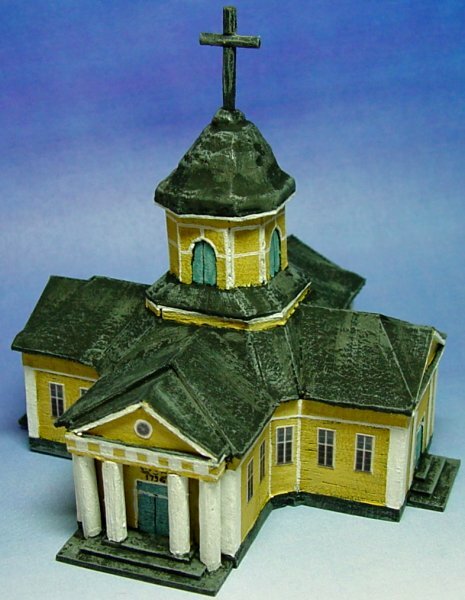 The roof layer is build around an octagonal frame, on to which the central roof panels lean on. The tower layer is yet another octagonal frame with the cupola on top of it. The roof was constructed from 1 mm card. 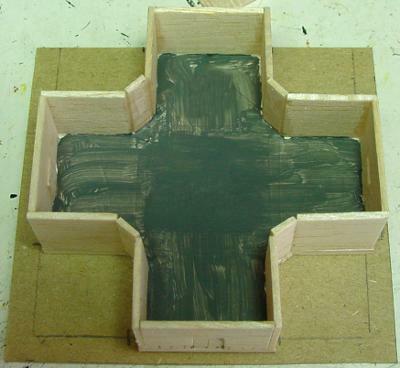 Cutting and fitting an octagonal roof with decorative insets is quite laborious. It is better to build one wing at a time from custom cut pieces as there are so many angles and planes that any mass produced pieces are not going to fit together. 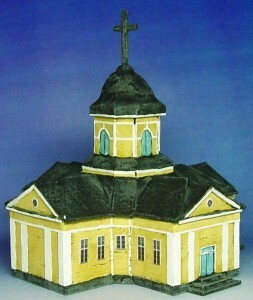 The cupola was sculpted from modelling clay. The wood paneling in the corners was done with paper strips. The natural texture of balsa is sufficient enough to give the wood effect on the walls. Notice that no windows were added at this point. 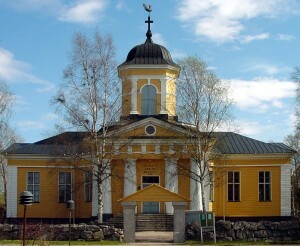 The church after painting. Smaller wood panel decorations were implemented by painting, e.g. in the tower. Windows are copied and printed pictures of the actual windows that have been glued to the model. Looks way better than any modelled & painted windows would. An angled picture from the backside.